The turn on the forehand is a misprized exercise. As it is the first exercise many riders meet when they first start riding, I think it has got a reputation as a beginner's exercise so most riders won't ride it as that may make them look as a beginner. I, however, love it, just because it is so plain and easy to do, for beginners and for the horses. In this article I will not talk about the rider's education, only about the horse. You can use the exercise in many levels of the horse's education, and you put different demands on the result depending on the situation. What everyone knows about the forehand turn is that the inner foreleg shall walk on place, up and down. There is less discussion about what the other three legs are supposed to do. Everyone also knows that for a young horse it is not important that the inner foreleg is on place, but it is never said what it shall do instead. Those inexact statements gives me a lot of freedom to make my own interpretation of the exercise. First time we use the forehand turn is to teach the young horse to walk away from pressure from our leg. If we press with our left leg the horse is supposed to move/yield his hind to the right. This is the basic idea with the forehand turn: Teach the horse how to obey the pressure from a single leg. At this premature stadium we don't care about anything else than that the horse walks away from pressure with his hind. There is no idea to avoid moving of the fore hand: There is never a good idea to tell the horse what not to do. All non wanted things the horse does first time we ask him about a new exercise is his guesses what we may want. He tries to figure out what we do and try different solutions It is not good blaming or punishing him for guessing or trying even if he do wrong. Better is to encourage him till he guesses right and then reward him. Though, if the horse walks away forward INSTED of yielding, then we may stop him. However: Most riders are so eager about making the turn with the forehand on place that they give a of aids preventively; most often they brake much more than needed. This often makes the horse frustrated as whatever he does he is told not to do, and he looses his impulsion. It is quite common that horses moves slightly backwards with the forehand during the turn, and that is a result of a to strong pulling and braking rein. A pulling rein also makes that the horse loose his impulsion, and maybe that is one of the reasons for the bad reputation of the exercise: It kills the horses mind. This is only true however, if we kill it. There we find the second reason to ride the forehand turn: To teach the horse to yield under impulsion. Then we must let the horse take small steps forward with fore hand. Now remember what I wrote above: The young horse is not supposed to walk on place with the forehand during the turn. The centered turn is not for education: It is for getting high point at a dressage show – to brag. I always prefer to make a bigger turn, instead of the narrow centered on place turn, also on educated horses as we then get a much more useful exercise. To reach this goal, I use some devise as a turning point, that shall be inside the horses inner shoulder so he can walk on a small circle with the fore hand and yield on a bigger one with the hind. While riding slightly forward during the turn, we reach the third goal of the exercise: To subtle the horse. Now the horse must yield his inner hind leg as he does in other lateral works: Swing it forward in under the belly and place it under the point of weight. The is a long stride. To do that the horse use to put his inner hip forward. Then it is easier to reach the point of weight. To move the inner hip forward he have to move the outer hip backwards. To do that he have to relax and stretch the back muscles on the outer side. Then we get a subtle bent and gymnastic horse wile riding such a plain exercise as the forehand turn. The Barrel Dance is a name I have give the forehand turn when you ride it around some object, like a barrel. It is not important what object we use. It has to be so big that it is easy for the rider to spot, but not so high that it interferes on the horse head order rider's leg. A steady barrel is perfect. The exercise is to let the fore legs walk with short steps forwards – not lateral - around the barrel on a small circle. You can alter the size of the circle. Either you hold the inner hind leg close to the barrel, or you leave 1-2 feet space. That is your choice – not the horse's. On unexperienced horses it is often better to start on a slightly bigger circle. The barrel shall be beside the shoulder. I don't want it in front of the horse or beside the head or neck. If you have the barrel in front of the shoulder while turning, to horse can not move forward and will lose the impulsion. The most common mistake or fault in a forehand turn, with or without barrel, is that the horse start yielding with the fore hand as a result of lacking impulsion. 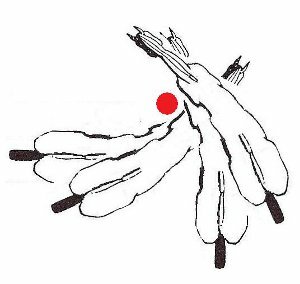 To get this small circle with the fore legs, the hind has to yield on a bigger circle, just as in a forehand turn without barrel. Your base aid for this exercise is your inner leg. As long as you keep the barrel beside the horse's inner shoulder, he does the exercise the right way. You will however find that the horse doesn't keep his shoulder close to the barrel. That's why the barrel dance is such a good exercise: Depending on how the horse is related to the barrel, you can understand what he's doing wrong and also find solutions to help him do right. The barrel stays behind the shoulder during a half or a whole lap: Everything is fine. Reward the horse and find something else to do. The barrel is beside or behind your leg: The horse has pushed forward instead of yielding. Ask him to stop and teach him to yield again with SMALL steps with the fore legs. The barrel is in front of the horse: The horse has lost his impulsion, maybe stopped walking with the fore legs and throws the hind to the side. Ask him to move forward and redo the exercise. The barrel is beside the shoulder but 5 feet away: I guess the horses is over bent (has lost his outer shoulder), yields with his fore legs and pushes with the hind legs. Straighten the neck with the outer rein and redo the exercise. Don't be afraid to halt to see where the barrel is and consider what you have to do to get it right. The problem you have is either that the horse doesn't understand the aids you use, isn't gymnastic enough to do the exercise as you want or loose his confidence and doesn't dare to do the exercise. The latter is a common reaction, no matter what exercise, when the rider starts using to many aids. Then it is impossible for the horse to obey and he either stops or runs away (escapes). Don't overdo the exercise. Don't turn more than 1-2 laps as the time. After that – ride away and let the horse trot or canter at least 30 seconds before you ride back to the barrel and try again. Don't do to many attempt on same day either. Overdoing the exercise will kill the horse's impulsion.